Jasper Conran opened his first hotel in the heart of the Medina in Marrakech in Autumn 2016. L'Hôtel Marrakech, a historic 19th Century Riad originally the central part of a Caidal palace, comprises five spacious suites surrounding a courtyard garden and swimming pool. This charming retreat combines delicious food, great comfort and service whilst capturing the elegance of hotels of the 1930s. L’Hôtel Marrakech prides itself on its approach to serving delicious traditional Moroccan home cooking in the manner Italians would describe as ‘cucina della nonna’ (Grandmother’s cooking). The emphasis on dining at L’Hôtel is the use of fresh local produce, attentive service and comfortable relaxed surroundings. At the centre of the culinary culture of Morocco is the tagine. Those served at L’Hôtel Marrakech are prepared in the traditional way, cooked slowly in earthenware pots, bringing out naturally bright flavours and delicate aromas. This method of slow cooking results in cuisine of great succulence and depth of flavour. Among the many types of tagines prepared at L’Hôtel Marrakech is chicken with prunes and almonds. The chicken is marinated in cumin which imparts warmth and richness. The dish is then gently spiced with ginger and cinnamon. Prunes and almonds are added to create a subtle sweetness that plays against the savoury and slightly bitter golden hued turmeric. A wonderful array of fresh herbs, aromatics and spices, such as the legendary ‘Ras el Hanout’ blend found in Marrakech, impart their special and unique flavours upon the dishes prepared by our chef Bouchra. Other key ingredients in the kitchen’s larder are preserved lemons, with their unique taste, texture and aroma and locally sourced olives in every flavour, colour and size, cured and treated in many ways with an array of seasonings. An abundance of seasonal well-known local vegetables, sun-drenched tomatoes and lesser known varieties such as cardoons enable the kitchen to create delicious vegetarian dishes. One of the most famous being couscous with ‘Sept Legumes.’ Traditionally, courgettes, potatoes, pumpkin, carrots, turnips, cabbage and onions are used. The couscous is flavoured with fresh coriander, parsley, spiced with turmeric and cinnamon. Finally, an infusion of saffron gently perfumes this classic Moroccan dish which is served with the hot aromatic paste, harissa. Dining for guests and non-residents* at L’Hôtel Marrakech is a truly memorable experience that celebrates the seductive nature of Moroccan cooking. If you're looking for a short break in the english countryside then we thoroughly recommend Poets House in Ely. Poets House is a charming hotel in the heart of historic Ely, perfect for weekend breaks, conferences, weddings and celebrations in Cambridgeshire. Poets House hotel is home to just 21 bedrooms, many have views of the Cathedral. The hotel's design is contemporary and the hotel is home to a street facing restaurant 'The Dining Room', serving both traditional and modern British dishes. A modern cocktail bar 'The Study' faces the hotel's courtyard. 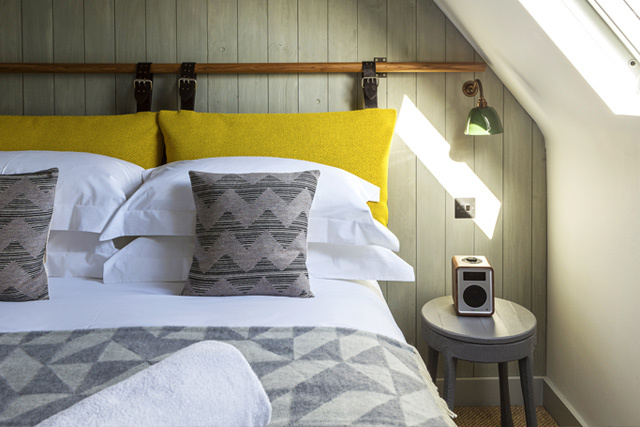 Originally consisting of three Grade-II-listed properties of the early 1900s and the home of a renowned local author, today, Poets House is a stylish luxury hotel ideal for short breaks. in Cambridgeshire is ideal for spring and summer walks as the days get longer. Ely has a beautiful waterside ideal for strolls discovering the local countryside. During the warmer months visitors can enjoy a boat trip along the River Great Ouse. Visitors can embark on Ely's Eel Trail! This walk invites walkers to discover the architecture and history of this small city. Ely's marshland and waters once contained many eels which were part of the local staple diet. Visitors can still sample smoked eel at Ely's award-winning Farmers Market. The Eel Trail highlights around 18 local attractions starting at Oliver Cromwell's House and Ely's tourism information centre where the leaftlet can be picked up. Other highlights of the trail include The Bishop's Palace, Ely Porta, Ely Museum, the antiques centre by the Waterside and of course the world famous Ely cathedral. Throughout the summer months Poets House offer a package which includes a boat trip. Ely Cathedral dominates the skyline and sits just opposite Ely's leading independent hotel, Poets House. The Cathedral has been the set for many major productions and most recently appeared in the Netflix drama The Crown. Ely is no stranger to film stars and over the years these have included Cate Blanchette, Natalie Portman, Kristin Scott Thomas and Eddie Redmayne and many others. As walkers explore the Eel Trail they will encounter a selection of public artworks that explore the life of the eel in this city. One of the highlights is the 3m high galvanised steel eel sculpture found in Jubilee Gardens. Poets House is located just 17 miles from Cambridge and 5 minutes by taxi or a pleasant 15 minute walk from Ely train station with direct, regular train services, to London Kings Cross. Poets House is ideal for pleasure and business and is also home to a dedicated events space which can host up to 70 people. Whether you are a fan of eels of not, Ely's stunning outdoors are the perfect place to soak up the sunshine. www.poetshouse.uk.com 40-44 St Marys Street, Ely CB7 4EY 01353 887777, B&B priced from £180.00 per room, per night. Summer Boat Break (Available July, August and September 2017)Enjoy a three course dinner each, overnight accommodation, a boat trip and breakfast each priced from £260.00 per room per night, based on two guests. On the back of its popular tours in the East End and Soho, Eating London is expanding its offerings in the British capital with the launch of two new tours in Brick Lane and the Docklands respectively. Both began operating in early May 2017. The Brick Lane – Flavors of India & Beyond tour is a 2.5hrs guided walk just after lunchtime which focuses on the British’s favourite cuisine: Indian food. Through nine tastings participants will indulge in the many different flavours of “Banglatown” a unique neighborhood that offers rare insight into the rich South Asian culture. From raw tamarind to traditional fish curries washed down with a refreshing mango lassi the experience will expose you to the region’s best flavors. The tour also includes dynamic street art, visiting an authentic Bangladeshi food shop selling exotic ingredients from South Asia and exploring the link between India, Bangladesh, Pakistan and Britain through stories about this vibrant and colorful community. Tours run daily 2.30pm – 5pm, £46 adults, £38 adolescent, £28 children. The London Docks - Historic Pubs and Classic Grub Tour takes guests to old pirates & artists hangouts one historic pub at a time, including the oldest riverside one in London. The 4hr tour covers tales of pirates, thieves and artists, told in the same places they once called home, and serves up some of London’s best craft brews and finest pub grub. Guest will walk through a quieter residential area, lined with cobblestone lanes and old warehouses to see stunning riverside views of London’s skyline. The company was founded in Rome in 2011 by American native, Kenny Dunn. His informal culinary strolls with friends and family became the Taste of Testaccio Food Tour focusing on real food, real people and real neighbourhoods. In 2013 another two tours in Rome were added, so was the first London Food Tour in the city’s hip East End. Since then, Eating Europe Tours has also successfully launched in Amsterdam and Prague. The company’s mission is to leave travellers with an unparalleled, non-touristy, food-related experience in undiscovered neighbourhoods across Europe. Last month saw the opening of the Kerry Hotel, the newest and most stylish addition to Hong Kong’s hotel scene and the first hotel in 20 years to be built on the Kowloon waterfront. With interiors designed by the renowned architect Andre Fu, this sixteen storey hotel has been designed as an ‘urban resort’, seeking to evoke an experience of relaxed luxury in one of the world’s most dynamic cities. Conceived as a stylish twofold dining experience, overlooking Hong Kong’s dynamic waterfront, Hung Tong and Red Sugar Bar are the latest creations of architect André Fu and his studio AFSO. Both bar and restaurant are intended to celebrate the heritage of Hung Hom, once home to Hong Kong’s dockyards; a nostalgic tribute to the city's former shipbuilding industry. Diners entering the restaurant will find themselves in a modernist red brick pavilion, created as a free-standing gem set atop a vintage warehouse. As part of his vision to bring the city’s past alive, Fu has employed a surprising palette of bold patterns and colours – he has juxtaposed a bold checkered carpet against a hexagonal parquet floor, against a backdrop of 60s metallic door frames. In keeping with the Hong Kong spirit, an array of bespoke hexagonal rippled glass pendants and vintage-inspired leather chairs have also been introduced to create a luxurious yet comfortable atmosphere that is both classic yet contemporary. Adjoining Hung Tong, the arrival journey to the Red Sugar bar begins with a whimsical neon installation by local artist Adrian Wong – walking through the enticing passageway, guests encounter a prominent brass feature fireplace. Decked with an asymmetrical layout of cozy lounge seats and Cadillac inspired couches in a palette of oranges and marine greens, Red Sugar is at once luxurious yet industrial. The room is also adorned with hanging tropical plants to convey an urban oasis atmosphere. Set against floor-to-ceiling windows that showcases Hong Kong’s unique skyline, the bronze cocktail bar is designed as a scaffolding structure and is highlighted with stunning Lasvit Tac/Tile pendants, designed by Fu, that evoke a strong modernist sensibility. The jewel in the crown is the breath-taking outdoor deck and garden terrace that appears to jut out into the city's Victoria Harbour and presents a birds’ eye view of the harbor and city. The garden uses steel planters, exposed aggregate and wild landscaping to reinforce the idea of an urban and contemporary al fresco experience. Summer has arrived so it’s time to catch some rays whilst you can. Why not escape the hustle below and head to the rooftops of Oxford Street at Sisu; London’s latest cocktail hotspot? Alternatively, whilst over in Victoria’s new Nova Building, Rail House Café provides the ultimate backdrop for all-day al fresco lounging. Finally, over in East London, 8 Hoxton Square offers a peaceful terrace for lunch, dinner and weekend brunch. Rail House Café opened in March 2017 as a modern, all-day café with a menu of signature twists to international favourites. Their spacious terrace is perfect for summer dining and aperitifs with room for 80 covers. Bespoke furniture has been designed to create a setting that blends indoor and outdoor seamlessly; with large L-shaped sofas decked out in nautically striped fabric, and more formal dining tables set between large sun shades. Menus packed with fresh flavours are available al-fresco; from breakfast and brunch, through lunch and dinner – with standout dishes including Green Tea Waffles with Coconut and Berries (£9.50) or Freekeh and Feta Salad with Pomegranate, Cashews, Mint and (optional) Hot-Smoked Salmon (£11/£15. Cocktails such as ‘Saffron Spritz’ (saffron gin, rhubarb liqueur, tonic, Chandon Rose at £10.50) and ‘The Seoul Train’ (watermelon juice, Sangsom Rum, Jinju 24, lime juice, coriander at £8) can be enjoyed from 10am daily. Sisu is serving up the best rooftop vibes in town, as the space has been transformed into an urban hideaway where Londoners can escape the bustle of the city in Scandinavian-inspired surrounds. The ReTreat serves an irresistible menu of street-food inspired bites such as Miso Aubergine Tacos, Fried Chicken Waffles and Canadian-style Poutine, and to accompany, there’s a drinks list running from Negronis dispensed from a bespoke, coin-op cocktail tap (£8 each, to cocktails in regular (£8) or large (£13) jars, like the summery Florodora (Bulldog gin, fresh raspberries, ginger) or Moltó Negre cava (£6 per glass), if bubbles fit the occasion. Sisu, tucked away behind a secret entrance near Marble Arch, is open daily from noon until 10pm. 8 Hoxton Square is the sister restaurant to critics’ favourite 10 Greek Street. Just like its Soho sibling, it serves fresh, seasonal dishes alongside interesting, low mark-up wines, but here reservations are taken. Guests can enjoy the sunshine this summer within the intimate al fresco dining area overlooking Hoxton Square, making for a picturesque brunch, lunch and dinner. Two daily-changing menus – one for lunch and one for dinner – as well as an all-day small plates menu are served, with brunch classics adding to the weekend lineup. There is a strong focus on seasonal British ingredients but executive chef Cameron Emirali (who co-owns the restaurants with business partner Luke Wilson) also draws inspiration from his travels. Small plates, such as charcuterie (£9) and fried baby squid (£8) have proved popular amongst diners, with their stellar selection of rosé proving the drink of choice this summer. Ian Haigh and his Central Design Studio have recently completed a stunning refurbishment on the historic Grade II listed building, the Mercure Bristol Grand Hotel. The extensive renovation gave the building a new lease of life, revitalising the 155 guestrooms, reception, lobby and public areas, as well as the restaurant and bar – Keepers. Known for his love of artisan producers and telling a story within his design, Ian has used Bristol’s well-known street art scene coupled with the historic Victorian architecture, as his main inspiration and narrative for the design. Working with the local gallery and the street art festival Upfest to curate artwork displayed throughout, the Bristol Grand hotel features over 500 pieces by local artists. Collaborating with emerging textile designers Kitty McCall and Midula Dey to develop unique upholstery fabrics, the building also features wallpaper prints by Elli Popp, and printed fabrics by Claire Gaudion and Jon Burgerman. Furniture and lighting for the project has been bespoke designed by Ian and the Central Design Studio team, including a feature chandelier in reception with handmade glass panels by artisan Jo Downs. Designer Ian Haigh established Central Design Studio in 2010 after 12 years of working for some of London’s best known design companies, including David Collins, United Designers, and Martin Brudnizki where he was a Director. Over the last five years, Central Design Studio has carved a reputation for designing relaxed and informal interiors. They, very purposefully, do not just have a ‘signature style’, but rather an underlying design philosophy often focussing more on how a space feels, not just how it looks. Central Design Studio originated from the idea of being a small team at the centre of the design process. Working with artists, artisans, craftsmen, manufacturers and builders, they pride themselves on delivering personal and coherent projects. Mercure Bristol Grand Hotel, Broad Street, BS1 2EL, Bristol, UK. To celebrate everyones favourite person, their Mum, Bea’s of Bloomsbury have created a special Mother’s Day Afternoon Tea with brand new additions just for the occasion on Sunday 26th March. Included in the afternoon tea will be new delicious treats; mini Lemon Tarts, handmade Chocolate Eclairs and beautiful Blue Berry, Lavender and Rose macaroons. Priced at just £26.50 per person it is available at Marylebone, St Paul’s and Bloomsbury locations. However if you can’t make it to Bea’s on the day they have created several special cakes and treats that would make perfect gifts. The Mother’s Day collection includes a stunning Raspberry & Vanilla cake that can be personalised with your own message and a special handmade Cupcake Box. Treats from the collection start from £1.85, making Mothers Day with Bea’s a truly an affordable luxury. The H10 Hotels group has entrusted the designer Jaime Beriestain to design their first five star hotel, under The One Hotels brand, that has just opened its doors in the heart of Barcelona’s Example district. Jaime Beriestain has prioritized the use of natural light, fine materials and excellent finishes for this project. The objective is for guests to feel at home, with all the comfort and well-being of a private residence. The hotel has 89 spacious room, 25 of which are suites, and each one has a special character thanks to the original artwork of Fernando Prats. The presence of works of art in the rooms, and the communal spaces in the hotel are original canvases of established artists such as Antonio Tàpies, Manolo Valdés, Yago Hortal, Manolo Ballesteros and Chilean artist Fernando Prats. They make up one of the pillars of creativity in the foundation for this project. The driving force behind Beriestain’s design here, has been to establish a parallel with the artistic effervescence of the City Condal. To this end, it boasts prestigious art galleries such as Miguel Alzueta, Senda and the Gallery Prats. The One Barcelona Hotel is designed for both foreign visitors and the locals. Therefore, Jaime Beriestain has broken with the traditional hotel codes and opened large windows in the common areas that invite you to discover this beautiful establishment. The hotel has a Sky Bar with an exceptional location and 360º views to the most emblematic buildings of Barcelona, such as the Casa Milà, the towers of the Sagrada Familia, the Cathedral of Barcelona and the Mediterranean Sea. For the Sky Bar, Beriestain has selected glass rails, which allow for total panoramic views. In addition, he has used dark oak wood to absorb the excess of light and maintain the natural color of the rest of the spaces. Bea’s of Bloomsbury are delighted to announce the return of their famous Valentine’s Afternoon Tea and treats. What makes this year extra special is the addition of brand new homemade treats from Bea’s onsite kitchens. Founded in 2008, Bea's of Bloomsbury are a modern bakery, serving inspired treats, afternoon teas, traditional breakfasts and lunches, with a twist, together with a fine array of beverages, using only the finest ingredients, at great locations, around London. For their many fans, Bea’s famous Valentine’s Afternoon Tea is back for one day only on 14th February. Included in the afternoon tea will be amazing new Heart Macaroons with raspberry & rose filling and Bea’s brilliant Brownies, made into a heart shapes, just for the occasion. The Marylebone, St Paul’s, and Bloomsbury locations will all be open until 9pm, and priced at just £50 for 2 people, It’s the perfect way to treat your special someone to a really enjoyable experience, complimented by great service. Bea’s offer a take away service at all locations, and if you would rather enjoy your Valentine treats at home, this year there are boxes of 6 romance inspired cupcakes, and Triple Chocolate Cake, for serious chocolate lovers – perfect for sharing. Starting from £1.85, Valentine’s with Bea’s is truly an affordable luxury. Valentine’s treats start from just £1.80 and the afternoon tea is £50 for two. This January, Social Wine & Tapas has joined London’s burgeoning brunch scene with the introduction of a flavourful, Spanish-inspired brunch menu designed for sharing. Developed by Executive Head Chef, Frankie Van Loo, the menu spans carefully curated plates of modern tapas-style dishes made using the best of British produce. The brunch is available every Saturday from 12:00pm until 15.30pm. Offering dishes far more exciting than the usual eggs benedict and avocado on toast, the innovative menu is split into six sections ranging from small ‘para picar’ plates such as jamón and manchego toastie with quail’s egg to larger plates of egg, vegetable, fish and meat options. A re-imagined version of Jason Atherton’s Pollen Street Social signature dish the full English breakfast makes a return, combining tomato fondue, mushroom ketchup, slow cooked egg, potato foam, smoked pancetta, and black pudding. With additional standout dishes including pan fried hens egg, chorizo jam and avocado on brioche, roast suckling pig with morcilla croquette and apple-cider caramel and honey truffle burrata, Brogdale apples, pear and chestnut. To complete the experience in true Spanish style, delicious cinnamon dusted churros with thick hot chocolate for dipping will be amongst the dessert options. Guests can order a selection of dishes from the brunch menu or opt for the ‘Feed Me Brunch’ offer for £20 per person. A surprise selection of Frankie’s favourite brunch plates, including off-menu specials, will be served to share. Introducing Martello Hall, London's newest all-day and late-night venue offering bottomless coffee and hot-desking by day, wood-oven pizza, gin-distillery, late night DJs and decandence by night. Beautifully created by design studio Red Deer, Martello Hall is set over three floors with warehouse glamour setting the tone. Weathered timber, reclaimed cast iron and coppers bar tops set the scene at Martello Hall, inviting Londoners and visitors alike in, any time of the day. Vibrant, cosmopolitan and chic, Mendeli Street Hotel, located in the bustling Mediterranean city of Tel Aviv, encompasses all the cornerstones of sophisticated urban hospitality. Situated just two minutes from the beach, this hotel blends fine cuisine, décor and the latest Israeli art and design trends to provide its guests with a unique Tel Aviv experience. The hotel is owned by the Steinbach family and originally opened in the 1960s. After it was handed down to the third generation, Mendeli Street Hotel went through a complete rebranding and major renovation, finally re-emerging onto the Tel Aviv tourist scene three years ago. Since its rebirth, Mendeli Street Hotel has remained loyal to its goal of paying homage to the extraordinary city it’s located in. Upon first entering, visitors are enticed by their surroundings. Tel Aviv’s dynamic art scene is exhibited across the hotel and complemented by the hotel’s contemporary style that utilises clean lines, natural hardwood furnishings and leafy green ferns. The 66 rooms of the hotel mirror the same overall style and are designed to reflect the nearby beach atmosphere. The elegant and sophisticated rooms display different and ever-changing commissioned Israeli artworks, adding to the overall feel of balance and harmony the hotel provides. The Mendeli not only projects Tel Aviv’s signature style through art and design but also keeps up with the city’s up-and-coming culinary scene. 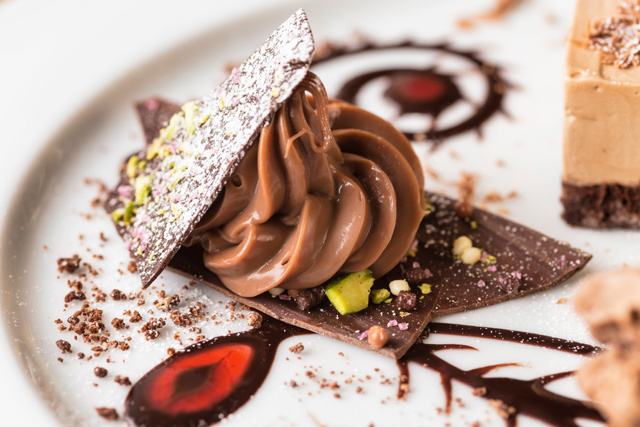 The Mendeli Street Hotel is itself home to one of the city’s best restaurants. Mashya, headed by the renowned Chef Yossi Shitrit, has become a sensation amongst locals and guarantees a fresh and innovative culinary experience. It is the ultimate restaurant adaptation of what the hotel offers. With a dedication to local style and historical authenticity, it is a tribute to Tel Aviv's culture. At Mashya every flavor, smell and sight is deliberate and unique, with Chef Shitrit incorporating local spices and produce with some of the most advanced cooking techniques. With an open kitchen and extensive wine list, this restaurant has become a standout in a city dedicated to sensational dining. Should visitors wish to venture into the rest of Tel Aviv’s culinary scene, The Mendeli offers proximity to the heart of Tel Aviv. For those wishing to escape the urban life and see more of the country, daily tours can be arranged from the 24 hour concierge desk, providing each guest with a personal and tailor made experience. The Mendeli Street Hotel is a sophisticated tribute to the dynamic character of a remarkable city. There's something grandiose about the convoluted name of this Galician city, flung out in the far north west of Spain's peninsula. In fact, it refers to St James (‘Sant Iago’) and ‘the field of a star’ so there is a poetic element which reflects both the literature and the magic that Galicians specialise in. Remote in place and in spirit, the character of this regional capital with its strong Celtic and Portuguese links is quite distinct from the rest of Spain. Not so long ago it took a week to get here from Madrid. Yet, for more than 1,000 years the city has opened its arms to a steady flow of pilgrims, on foot or on horseback, coming from all over Europe. After a long lull in popularity, the tradition resumed a couple of decades ago, bringing dozens of nationalities kitted out in walking boots, clutching staffs and with symbolic scallop shells dangling from backpacks. Some Lycra-clad followers of the Camino now arrive on bicycles. It is this foreign cultural input that has helped make Santiago unique. Beside the cathedral stands the world’s oldest hotel, opened in 1500 as a hospital for pilgrims and now top of Spain’s chain of national paradors. There are glorious patios, halls, galleries and grand staircases, making it all too easy to be bewitched by the time-travel atmosphere of this city. There are sober granite houses, narrow winding streets, leafy squares, stone arcades, glassed-in balconies (typical of windy Galicia) and magnificent religious buildings. Galicians are also increasingly fine-tuned to sharp design. In the arcaded rua do Vilar, upmarket designer Katuxa Plateros (http://katuxaplatero.com) transforms gold, silver and semi-precious stones into dreamy shapes and, a few doors away, tiny Baraka (www.barakajoyas.com) stocks imaginative pieces by an array of local designers. Food is of course a priority in this land of verdant pastures, cattle, smallholdings and two coastlines whipped by the waves of the Atlantic. A dazzling range of products are now wrapped in chic packaging for specialist delicatessens. In the streets behind the cathedral there is Mestre Mateo, rua Nova 3, a delicatessen which stocks unusual black Galician pottery beside conserves, chocolates, rare Galician olive oil and wine. Even the wine is looking up, as dusty old labels are replaced by clean modern fonts. Galicia's white Albariño wine from the Rias Baixas has shot up the oenological hit parade, and sprightly red Mencía from the Ribeira Sacra is following fast behind – even if production dates from the Roman era. One of Santiago’s great assets is its easy access to the crazily indented coast that harbours Galicia’s famous rias, or inlets. Here you can teeter over the crashing surf beside the lighthouse at Cabo Fisterra, about 90km from Santiago on the Costa da Morte, and observe the rocky source of all those delicious percebes (goose barnacles). For hedonism, though, head south of here to Galicia’s longest beach at Carnota – seven blissful kilometres of blinding white sand where you might come across cockle-gathers or surfers. Finally, the beautiful dunes of Corrubedo, which are protected as a natural park, offer an idyllic escape from other sun-bathers, while plenty of wind-surfers dot the waves. Any of these destinations make an easy day outing by rental car from Santiago. Hotel Gastronomico San Miguel http://sanmiguelsantiago.com/ from 74€ / double with breakfast. Hotel Casa de la Troya http://www.carrishoteles.com/en/hotels/hotel-casa-de-la-troya-santiago/ from 60€ / double, room only. O Curro da Parra www.ocurrodaparra.com. A charming rustic restaurant near the food market serving exquisite Galician specialities prepared with a light, modern touch. A la carte about 35€. Sexto II, http://www.restaurantesexto.com Near the Cathedral off the Rua da Franco, an old-fashioned temple to seafood, graciously served on white linen tablecloths. A la carte about 40€. Ryanair ryanair.com, Vueling vueling.com, Easyjet easyjet.com and Iberia Iberia.com all operate direct flights from the UK to Santiago de Compostela. Michael Caines, one of Britain’s most celebrated and best known chefs, is set to open the luxury country retreat Lympstone Manor in Devon in spring 2017. Located on the southern edge of Lympstone village, between Exeter and Exmouth, the Grade II listed Georgian mansion is set in 28 acres with unrivalled views overlooking the Exe Estuary. In the process of being fully restored and renovated by Michael and his team of talented architectural and interior design specialists, the former private home will be transformed into a 21 bedroom hotel featuring contemporary interiors that still retain a sense of place and a 60-seat fine dining restaurant. The third (and last) B&B Heart Home visited as judges for the Dorset Cereals Awards 2016 was Camomile Cottage, a 16th Century timber framed farmhouse on the outskirts of Eye in Suffolk. Camomile Cottage is situated down a single track private lane and is surrounded by a wonderfully mature garden. Inside the two double ensuite bedrooms are decorated in a style to suit the history of the house. It's beams, sloping floors and low door frames are charming reminders of its age, but it has been renovated and furnished with comfort in mind. Something we were thankful for as we sank into the duck down pillows after a hearty meal at the local pub. But with this B&B you don't just get a room. You also get free run of the downstairs sitting room (with a roaring log-burner) a guest kitchen (fully stocked with every tea or coffee you have ever heard of) and a sun-room/breakfast room from where you can watch the wildlife in the garden. And you also get Aly the owner, who could not have made us more comfortable with a pot of tea and home-made cake on arrival, tea or coffee in bed if we so desired, and a beautifully cooked breakfast. If you can tear yourself away, Camomile Cottage is within easy reach of the historic city of Norwich and the Norfolk Broads, Bury St Edmunds with it’s traditional market and Abbey ruins, Ipswich quay, Woodbridge with it’s sailing and Framlingham’s impressive castle, Debenham’s antique shops and the artistic coastal havens of Southwold, Dunwich, Aldeburgh and peaceful Walberswick. We didn't have time to explore but we did visit nearby Eye with its castle relics and impressive church and guildhall. Following on from our previous post on the Dorset Cereals B&B awards, the second one up for judging was The Old Stocks Inn. Situated in the heart of Stow, Cotswold, this b&b brings together a mix of 17th-century charm with modern day luxury. We were completely smitten. 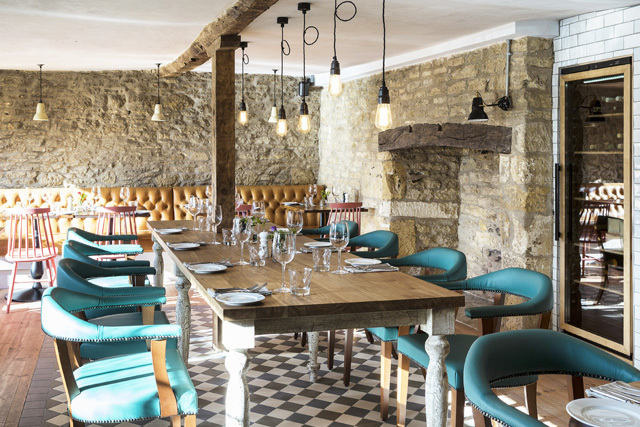 Wanting to move away from the dark and rustic feel of so many Cotswold hotels, The Old Stocks Inn underwent major refurbishment in the last year. 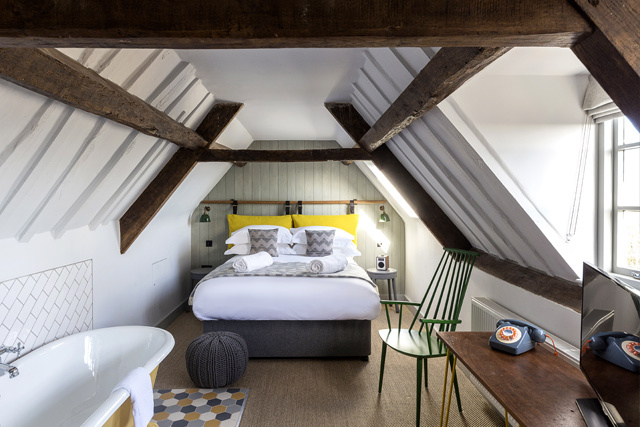 Keeping the best of their 17th century heritage – the beams, the Cotswold stone walls and the oddly-shaped rooms sprinkled with modern colours and fabrics that feel fresh and inviting. From restful rooms and hearty food, to artisan coffees and hand-crafted ales, The Old Stocks Inn has something special to offer and gives the warmest welcome in Gloucestershire. We thoroughly enjoyed our stay, with a super friendly staff we immediately felt at home. This b&b is full of quirky corners that we were busy off exploring and taking pictures. Theres a delightful coffee shop where we indulged in cakes and coffee upon our arrival. We also highly recommend the restaurant, as the food was delicious and they offer a really interesting menu. To finish the evening we sipped cocktails by the bar which we were very impressed by! The following morning we had a mighty breakfast to kick start the day! Again we were spoilt for choice. The Cotswolds is located in South Central England and spans across Gloucestershire, Oxfordshire, Wiltshire, Somerset, Worcestershire and Warwickshire. The region’s most iconic landmark is of course the rolling Cotswolds Hills, but it’s also famed for its picturesque villages, river valleys, beech woods and lush green meadows. Stow is a welcoming, cosmopolitan town and a captivating place to visit. Brimming with history, it’s also home to contemporary coffee houses, traditional tea rooms, antique shops, pubs and boutique hotels. A farmers’ market takes place on the second Thursday of every month and is packed with fresh local produce.